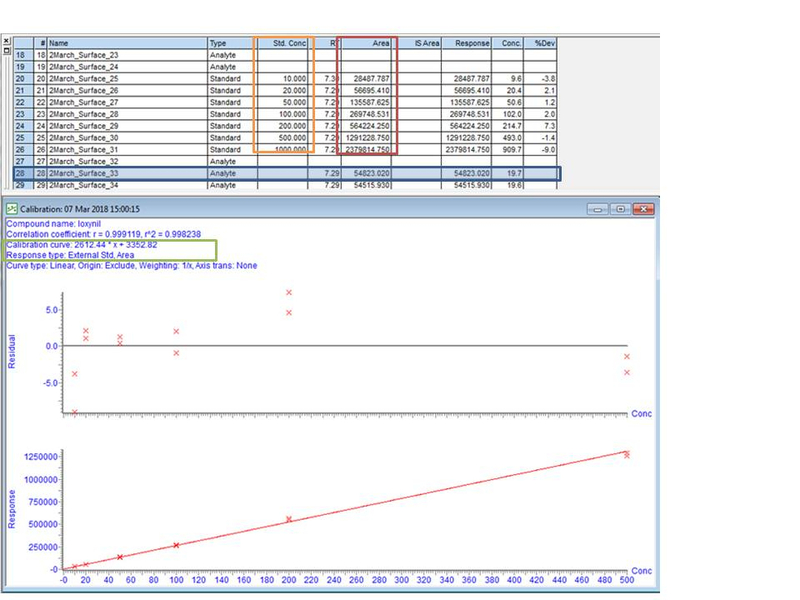 We are using the software Masslynx combined with Targetlynx XS and running a standardcurve. The result of the samples are calculated automatically and presented in "Calculated Conc" field. Can anyone tell me how the formula of the "Calculated conc" in Targetlynx XS looks like? Can´t find it anywhere in the softtware. The following guide, available on the Waters' website, will hopefully provide all the detailed information you require on integration and calculations (click here to access). To answer your question very briefly and generally, the formula used to calculate the concentration will be based on the equation of a line ( y=mx + c). The exact calculation will depend on a number of parameters set to build this line (all detailed in the guide referenced above). As an example, taking a basic, liner plot, the equation of the line (highlighted by the green box below) is shown on each plot in TargetLynx, along with some key parameters of the curve. In this example, the x value is taken from the known concentration (highlighted as Std Conc, by yellow). The y value is being taken from the peak “area” column, highlighted by the red box (simply the area integrated under the peak). Once this information is plotted (as y against x) the "calculated concentration" will be determined off the curve ( y= 2612.44 x + 3352.82). In this example, the concentration is calculated as 19.7 ppt for the sample highlighted in blue, as the peak area of 54,823 was inputted into the equation as y. This is, of course, the simplest form of how the concentration is calculated by TargetLynx and your calibration curves and methods may have many other parameters to be considered in the calculation. Please check out the guide for more details on the algorithms applied in TargetLynx for integration and quantitation.